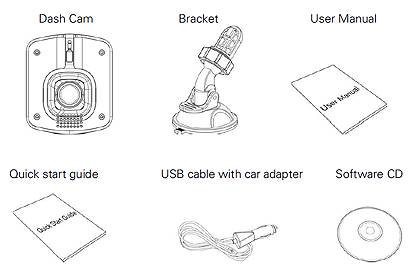 The PD-G55H is a lightweight windshield mounted dashboard camera that features a 2.4″ LCD screen for menus and playback, and an interior directional microphone for recording in-car audio (which can, of course, be disabled). This camera is made by Polaroid, the American camera company. 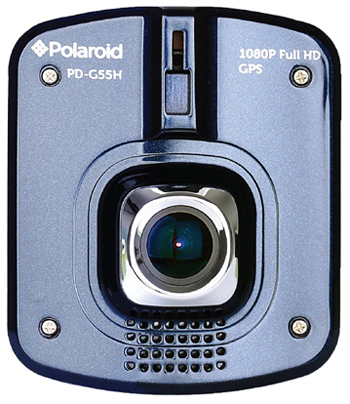 Compared to Polaroids other dash cameras, the PD-G55H features a wider 153 degree field of view, and a larger display. Unlike the other cameras, this one features a visually distinct housing and design, with a blue front and a concave rear panel, with buttons on the side. The outer casing of the camera is firmly secured with visible screws. The Polaroid PD-G55H shoots full HD 1080p video at 30fps, however it can also be configured to shoot at WDR 720p for extra memory card space. The daytime footage is reasonably crisp, however the camera’s small image sensor struggles at night, compensating with high ISO and grainy footage. The best feature of the camera, by far, is the configurable G-force sensor that allows the camera to automatically highlight sudden changes in speed in case of an accident. This sensor is controllable, allowing owners to determine how sensitive they want it to be. This is great for city drivers, who deal with frequent starting and stopping and don’t want false positives from the camera. The camera comes with a built-in rechargeable lithium battery that allows the camera to record even when the car is off. This feature is valuable for anyone who needs a dash camera for security purposes, as it allows users to continue filming after the car has been parked. The Polaroid PD-G55H has a microSD card slot for microSD and microSDHC memory cards. According to the manufacturer, the PD-G55H supports up to 32gb SD cards, which is smaller than most dash cameras. Users looking to record long segments of video without using the camera’s looping feature may want to look into more robust 2-slot dash cameras. The Polaroid PD-G55H’s Continuous Loop Recording allows users to setup the camera as a ‘fire and forget’ monitoring tool. In this setting, the camera records a continuous loop of footage, maintaining a buffer of the most recent recording, as well as footage of any sudden speed changes. All recordings include time, date, and location information for the sake of safety. As an added bonus, the Polaroid PD-G55H also features a photo mode. This mode lets users take pictures instead of video, for the sake of documenting accidents or other occurrences. 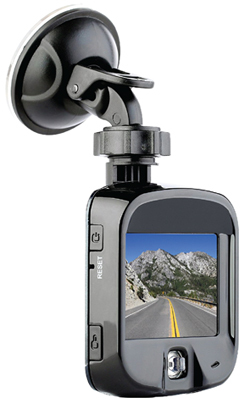 This mode — which not all dash cameras feature — is important for insurance purposes in the case of an accident. If you’re looking for an affordable and easy to use wide-angle dash camera, the Polaroid PD-G55H is a good choice. With its configurable G-force sensor, large rear LCD for playback, and built-in picture mode, the Polaroid PD-G55H provides a notable level of security.